It can be nerve-racking when there’s cause for concern about an electrical appliance or wiring within the home, so you’re more than likely to ask friends and family to recommend a Staffordshire domestic electrician who’s reputable. But what happens if they don’t know anyone? At Day & Knight Electrical Solutions we’re proud to have a been a Which? 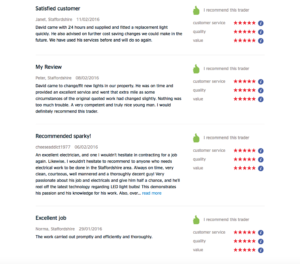 Trusted Trader for several years and you can publicly read what our existing customers say about us here. In fact, not to blow our own trumpet, but we’re that good we were even nominated by our customers for the coveted Which? Trusted Trader of the Year Awards in 2016. We didn’t quite make first place but we were one of the top four in the country! The Which? Trusted Trader scheme is in place to support customers, just like you, who may be unsure about who to trust when it comes to inviting a trader into your own home and trusting them to perform a good job at a reasonable price. More importantly, you need to be sure that they stick to the original price quoted and have all the necessary certification in place for safety and compliance. Fortunately, the scheme is quite intense and not everyone passes! There are a number of financial and official documents that need to be verified and standards of work that are reviewed against stringent quality benchmarks. Once all has been checked and approved, the mark of excellence is awarded. As a fully trained and trusted Staffordshire domestic electrician I can cover all the basics from lending a helping hand to fit new sockets and switches to diagnosing electrical faults and conducting a full domestic rewire. I also have a team of contractors should you have a short timeframe for the electrical work to be completed or for a complex redevelopment or new build project. 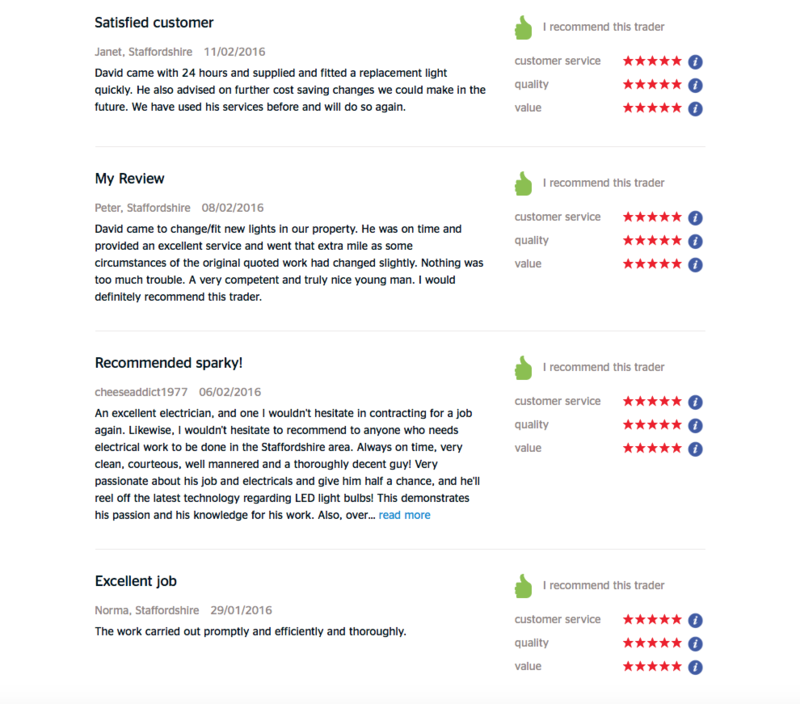 At Day & Knight Ltd we always strive to improve the service we offer and customer feedback is an essential part of the learning and development process. Please feel free to read some of our reviews as a WHICH? Trusted Trader, received over the last 12 months. “We received outstanding service from Dave who worked extremely hard to get us straight for Christmas after unexpected work was needed to our house. The workmanship and equipment installed was superb and every effort was made to ensure mess and disruption was kept to a minimum. We would not hesitate to recommend this company. 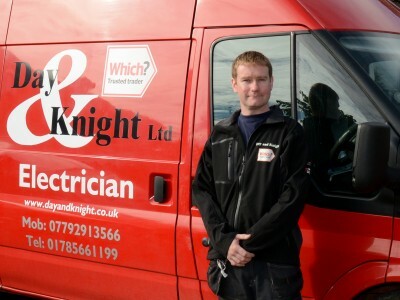 A big thanks Dave.” Kevin Sneddon 30/12/2015 If you’re looking for a credible and trustworthy Staffordshire domestic electrician, please call Dave and the team at Day & Knight on 07792 913566 or complete our email contact form here. This entry was posted in Articles, Commercial, Domestic and tagged commercial electrician, Commercial electrician near me, electrician stafford, electrician Staffordshire, family business, Local Business, low cost electrician, reliable electrician Stafford, Review electrician stafford, stafford.